As rumoured, Apple has updated the Retina MacBook Pros with better processors and more RAM for both the 13-inch and the 15-inch models. The 13-inch MacBook Pro now features a 2.6 GHz i5 processor with Turbo Boost of up to 3.1 GHz in the two lower end options and a 2.8 GHz i5 processor with Turbo Boost of up to 3.3 GHz in the third, higher end option. The cheapest option now comes with 8GB of RAM as standard, instead of the 4GB of RAM that came before the update. None of the 13-inch options have received a storage upgrade, but you may configure your MacBook with a new 1TB storage option. A 3.0 GHz i7 processor with Turbo Boost of up to 3.5 GHz is also available. The lower 15-inch model MacBook Pro now start with a 2.2 GHz i7 processor with Turbo Boost of up to 3.4 GHz and a new standard 16GB of RAM. The higher end option now comes with a 2.5 GHz i7 processor with Turbo Boost of up to 3.7 GHz. You can now configure the 15-inch MacBook with a 2.8 GHz processor with Turbo Boost of up to 4 GHz. 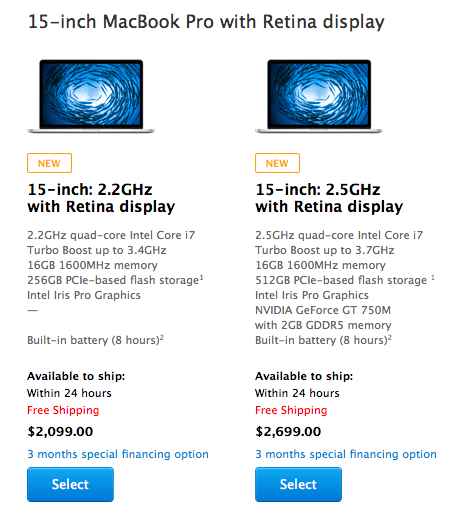 The prices of the mid 2014 MacBook Pros in Canada has actually gone up $50 CAD, which is disappointing. The 13-inch now starts at $1399 from the previous $1349 and the 15-inch starts at $2099 from the previous $2049. 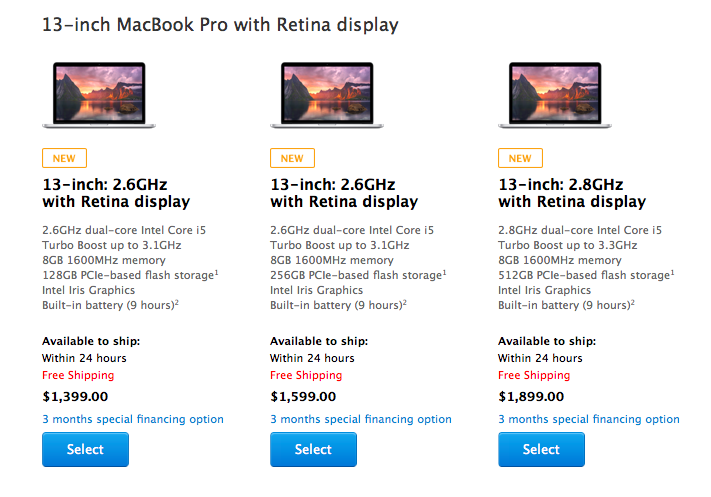 The non-Retina MacBook Pro is still priced at $1199 in Canada. However, in the USA, the higher end 15-inch model has received a $100 price drop, as did the non-Retina MacBook Pro.